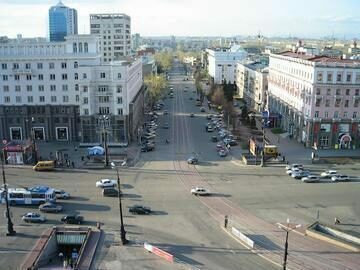 Chelyabinsk is the administrative center of Chelyabinsk Oblast. It was founded in 1736. The population of the city is 1,130,300. Chelyabinsk oblast, located deep within the European continent, is characterized by a continental climate with prolonged, cold winters, comparatively short, but warm summers, and transitional fall and spring seasons of short duration. Wind speed is different. In January-May it is 3-4 meters per second, but during snowstorms it can rise to 16-28 meters per second. In June-August the average wind speed doesn't rise. In September-December it is 3 meters per second. The average summer temperature is +25-30 °C. The highest data which was registered in 1952 was +48,3 °C. In winter the average temperature is -15-20 °C. The total area of Chelyabinsk is 837 square kilometers. The city is served by Chelyabinsk Airport. It is a big transportation and industrial center. There are 30 state and private institutes of higher eduction at the present time, the biggest of which is South Ural State University. There is also Medicine Academy, Academy of culture and art, Academy of physical training and many other institutes in the city. One military university is situated here - Chelyabinsk High Military Aviation Institute for Navigators.